Auf vielfachen (;-)) Wunsch hier ein Ring meiner Magisterarbeit! Wow, deeply impressed! Erstmal für die Sprache, Du schreibst ja ein tolles Englisch!!! Aber ich bin auch vom Inhalt total begeistert, unter diesem (eigentlich naheliegenden) Aspekt hatte ich die Romane noch nicht betrachtet. Hm, jetzt muß ich sie alle (noch mal) lesen, und die sogenannten "minor novels" kenne ich ja noch gar nicht ;-) Besonders interessant fand ich unter anderem den "chain of events", den Du für Tess aufgestellt hast, und auch die Arabella aus Jude werde ich von nun an mit anderen Augen betrachten... Wirklich toll!!! Edit 29.08.: heute an holle verschickt! Und heute ist es angekommen, die "Introduction" habe ich schon gelesen und bin ganz neugierig auf Weiteres. Ich schließe mich lesezeichen an und befürchte, dass ich nun meine Th.H. Bücher auch noch einmal werde lesen müssen. Wenn elhamisabel einverstanden ist, werde ich ihr das Buch am Samstag in Köln persönlich übergeben. Got it from holle77 at the VMC. I just realised I haven't ever read any Hardy. But I'll try it anyway. Maybe it makes me want to read one of his books. I shouldn't have tried to read it at night in bed. Why? Because although it's a very good read and very insightful, it's still not a novel and being rather tired, I had to re-read passages of it over and over. Anyway, as I said, I haven't read a Hardy ovel before but this little book made me definitely read some of his works. Herzlichen Glueckwunsch an deine Magisterarbeit, SudoKris, wenn ich nur so gut auf Deutsch schreiben konnte! Ich habe damals 15,000 Woerter ueber Effi Briest geschrieben (fuer meine Germanistik Diplom) und das war ja hart genug!! I've pmed Penina for her address, so will hopefully post this off in the next day or two! Received this from nice-cup-of-tea a couple of days ago. Thankyou! and thanks for the cuppa:). I agree with your comment about Return of the Native. I was unfortunate enough to have been given it to read at school when I was 12. The whole class hated it and it put me off Hardy for many years. However, I tried again a few years later and read and enjoyed most of his best known novels. I shall certainly read this critique and hope my manners will give me the opportunity to make a reasonable comment in my schoolgirl German of 35 years past. 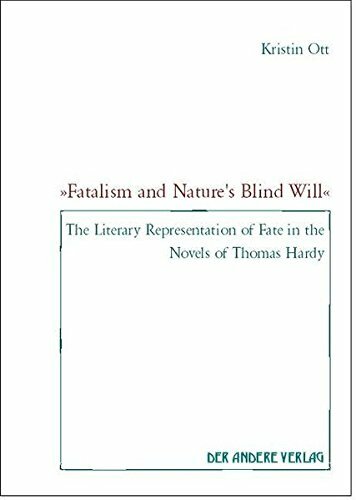 I really wish it was not such a long time ago that I read any of Hardy's works. I soon found myself wishing I had at least re-familiarised myself with the books being discussed. I read the first half quickly and easily but I found it hard to keep up my level of interest. This book is now on it's way to MathildaS. thanks for your Bookring, Sudokris, and for delivering it to me, pennina.